Another #101drams whisky I was able to tick off the list at The Auld Alliance - the Valinch is Auchentoshan's cask-strength, non chill-filtered version of their Classic, weighing in at 57.5% ABV. 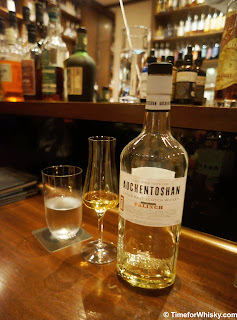 I was curious to try this as I've generally found the Auchentoshan's to be very light (as most Lowland whiskies are), so I wanted to see how a cask-strength version fared. Palate: Earthy, "gritty", spicy. Fair hint of cinnamon. Finish: Medium length, slightly grainy, cinammon still present until the end. Rating (on my very non-scientific scale): 85/100. Not a huge fan.